Manger Audio C1 review | What Hi-Fi? Originality is a scarce quality in hi-fi speaker design, so when we come across something as unusual as Manger Audio’s C1s we can’t help but celebrate. On paper, the C1s appear to be just another two-way active standmounter, but they turn out to be an intriguing, idiosyncratic proposition with well defined strengths that are hard to better almost regardless of price. The technical highlight is without doubt the distinctive, in-house wide bandwidth driver that, in this installation, handles the frequency range from 330Hz upwards. Such is the capability of this unit that the company quotes its overall frequency band as an astonishing 80Hz to 40kHz. No conventional drive unit of this size – approximately 19cm – can get anywhere near such a range, particularly at higher frequencies. Of course, this is no ordinary driver – Manger has been developing the design since the late 1960s. While the unit has recognisable components such as a voice coil, chassis and motor system, it doesn’t work in a conventional, pistonic way in the manner of traditional drive units. Its operation reminds us more of flat panel technologies such as Surface Sound (once known as NXT) or BMR in the way the sound is generated by the motion of the voice coil sending ripples through the triple layered flat diaphragm laterally. Think of it as akin to the ripples on the surface of water generating the sound. The rigidity of the diaphragm increases towards the outside, which controls the balance and dispersion of its sound output and that distinctive star-shaped foam around the perimeter minimises the build-up of structural standing waves. The result of using this kind of damping is reduced distortion and a cleaner presentation. A dedicated 180W Class A/B amplifier module provides the power. After the innovative design of the C1’s mid/treble driver the relatively conventional 20cm bass unit below it is easy to overlook. It’s a much more traditional unit with a glass/polyester sandwich cone and a decently sized 38mm voice coil. It’s driven by a 250W amplifier module, also Class A/B. That makes a total of 430W per channel, which should be more than enough to deliver high sound pressure levels, even in large rooms. The C1 is a sealed box design, so there isn’t a port to augment the speaker’s low frequency output. But the generous bass cone area coupled to a relatively large 50cm tall enclosure and all that power adds up to a pleasingly extended and authoritative bass performance. If you have a larger space to fill or need these speakers to go louder or deeper you can always buy the optional LF-module (£1173). This sits on top of the C1, doubles up on the bass driver count, and increases the loudness capability of the C1 by 6dB, which is quite a lot. The use of Class A/B amplification means there’s far more need for cooling than with the Class D alternative, so it comes as no surprise to find the rear of the speakers covered with heatsinks. These metal fins become warm during use but never uncomfortably hot. The Mangers are heavy monitors. They weigh in at around 30kg each, so the designers have thoughtfully integrated some handles into the heatsinks. They’ve even integrated rollers into those handles so that the speakers can be laid on their back and be pushed around on a smooth floor. There’s also such a roller built into the base of the dedicated stands to make manoeuvring easier. Manger Audio refers to these speakers as nearfield monitors, which implies use in recording studios. But they’re also available in a range of finishes, so domestic users haven’t been ignored. Build quality is as good as we expect at this level. The cabinet feels rock solid and both the C1s and their dedicated stands are nicely finished. The Manger’s appearance may split opinion – our samples look pretty brutal, but choose a different finish option and they will look smart in a domestic environment. When it comes to positioning, these speakers are immensely flexible. 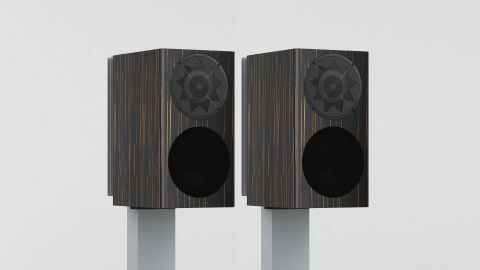 While they sound best about a metre into our listening room (well away from sidewalls) there’s enough in the way of tonal adjustability, thanks to a number of rear panel mounted controls, to get a balanced presentation in most circumstances. They’ll cope with a wide range of preamps too, due to adjustable input sensitivity. The signal input is limited to a single balanced XLR. Things are less straightforward when it comes to your listening position. These standmounters are very much a sweet spot design and their stereo imaging suffers notably when we move even a little away from our favoured seat. We end up sitting a little over 2m away from the C1s, with the two speakers about the same distance apart. We angle them so that they cross just a little behind our heads. This approach gives us the best balance of soundstage width and stereo focus in our test room. Manger make dedicated stands for the C1s. Though pricey at £800, these supports should be considered an essential buy from a sonic and visual perspective. They’re nicely made, damped aluminium units that attach to the speakers through an unusual tongue and groove arrangement. Gravity holds the speakers in place rather than spikes, bolts or Blu-tack. Any product at this level needs a top class source and electronics and these Mangers are no different. We use our usual Naim NDS/555PS music streamer and Clearaudio Innovation Wood record player for this test, and begin with the excellent Aesthetix Janus Signature preamp. It doesn’t take long to realise that this valve-powered preamp and the Manger speakers isn’t a happy match. The turgid and restrained performance has us switching to our long-term reference Gamut D3i preamp, which gives more balanced results. The presentation is notably more dramatic with a better sense of timing than with the Signature. We stay with the D3i for the rest of the test. In their areas of strength, the C1s are right up there with the best money can buy. The use of that single in-house drive unit to deliver everything from low midrange upwards clearly works. It means the C1s have a seamless sense of coherence traditional multi-driver alternatives just can’t match. Most conventional rivals have the crossover between the tweeter and midrange positioned at around 2.5kHz. That’s exactly the area of the frequency range that our hearing is at its most sensitive, and right at the heart of where voices exist. By moving the crossover as low as 330Hz, as Manger has managed, the C1s avoid all the phase and integration issues suffered by conventional alternatives in this all-important region. Instead you get a wonderfully focused and articulate presentation that sounds impressively life-like when it comes to vocal textures and low-level dynamic nuances. Listen to Last by the Unthanks or Aretha Franklin’s Dr. Feelgood and the Manger C1s’ impressive way with voices deserves the highest of praise, such is the passion and delicacy displayed. It’s hard to better their cohesion too – the speakers sounding seamless from the lowest bass notes upwards. In our experience only the likes of Quad’s ESL electrostatics or Eclipse’s TD range of single driver speakers do this kind of thing better. Though neither manages as well when it comes to low-end muscle or dynamic punch. The C1s readily show the advantages of using a good-sized active bass driver in a relatively generous cabinet. Low notes hit hard and true, digging surprisingly deep with a pleasing sense of grip. We play our usual bass torture tracks such as Massive Attack’s Angel and Hans Zimmer’s Time from the Inception OST and the Mangers lap them up, delivering the bass frequencies with an admirable amount of composure and heft. There’s little sense of stress or confusion even when the speakers are pushed hard. Listening to Angel also shows the C1s have great rhythmic ability. They render the insistent momentum of the music superbly, showing world-class ability when it comes to timing precision. Despite doing many things brilliantly, these speakers aren’t beyond criticism. Those sensitive to tonal purity will find them surprisingly uneven and lacking the skill to deliver a range of tonal colours naturally. Ultimately, their presentation lacks the cut-glass clarity of the very best at this level. At quiet levels, the mid to high frequency range – covered by that clever drive unit – aren’t delivered with as much punch as we would like, leading to an unbalanced and slightly bland feeling to the presentation. While this improves at higher volume levels the C1s never quite convince in this respect. Then there’s stereo imaging. Even once we take care over positioning, their soundstaging still lacks the spaciousness and scale of similarly priced alternatives. It’s a little congested and lacking in depth. Large orchestral pieces such as Orff’s Carmina Burana are denied their usual scale and impact due to the failure of the C1s to layer the presentation carefully. The Mangers C1s aren’t perfect, but for some, the speaker’s impressive coherence and timing will be hard to resist. Add that tuneful bass performance to their adjustable and upgradeable nature and ability to play at high levels, and it’s easy to understand their appeal. The C1s aren't flawless all-rounders, but remain tempting all the same.